Faceted search (also called faceted navigation, guided navigation, or parametric search) breaks up search results into multiple categories, typically showing counts for each category, and allows the user to “drill down” or further restrict their search results based on those facets. 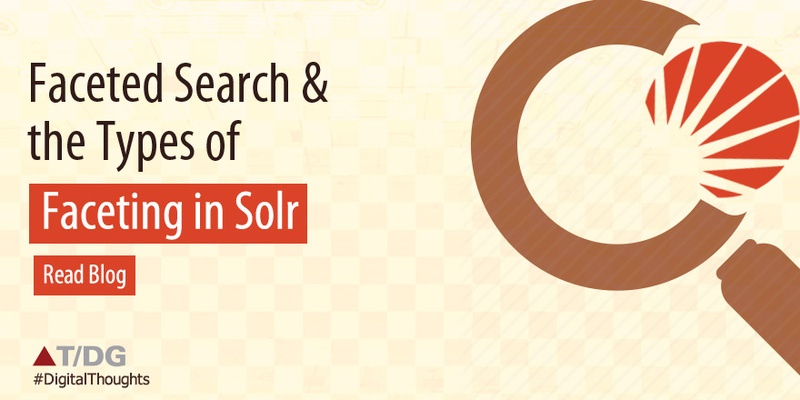 Now we will look into details of each faceting type supported by solr. Field faceting retrieves counts of all terms, or just the top terms in any given field. The field must be indexed. Example: The below query returns, count of terms in the field city. Range faceting is applied on any date field or any numeric field that supports range queries. facet.range.include Specifies inclusion and exclusion preferences for the upper and lower bounds of the range. Date faceting returns number of documents that fall within certain date ranges. Note: Use Range faceting instead of Date faceting as it is deprecated. Query faceting returns number of documents in the current search results that also match the given facet query. Interval Faceting allows you to set variable intervals and count the number of documents that have values within those intervals in the specified field. In order to use Interval Faceting on a field, it is required that the field has “docValues” enabled.Even though the same functionality can be achieved by using facet query with range queries, the implementation of these two methods is very different and will provide different performance depending on the context. If you are concerned about the performance of your searches you should test with both options. Interval Faceting tends to be better with multiple intervals for the same field, while facet query tend to be better in environments where cache is more effective (static indexes for example). Pivot faceting allow breaking down the values by category with additional sub-categories. Thus it allows to analyze your data in multiple dimensions.Imagine that in our store we have products divided into categories. In addition to that, we store information about the stock of the items. Now, we want to show how many of the products in the categories are in stock and how many we are missing. This calculation can be done using pivot faceting.